This is our 5* rated (see reviews below), super flexible, designed around you, family multi activity holiday. We think we’ve nailed the flexibility you’ve been asking for! 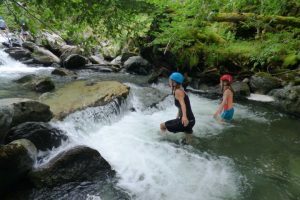 Thanks to our local adventure and accommodation contacts we’re able to create the multi activity holiday or short break that you and your family need. The range of outdoor adventure activities in the central Pyrenees is impressive and there really is something here for outdoors lovers of all ages. 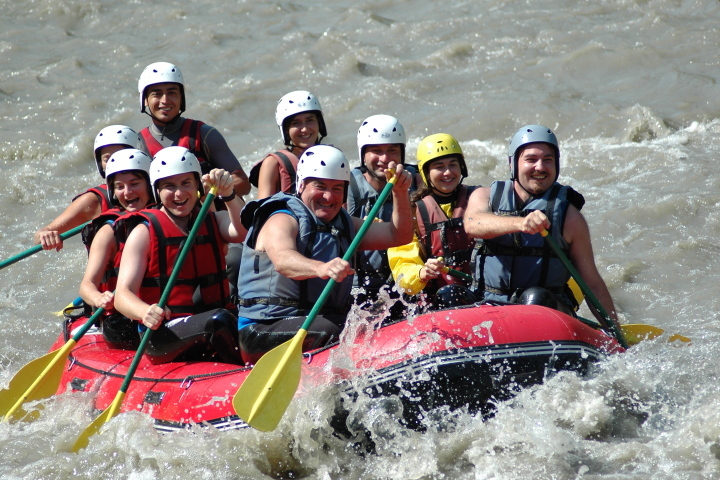 The fun starts in April when the riversports season kicks off. 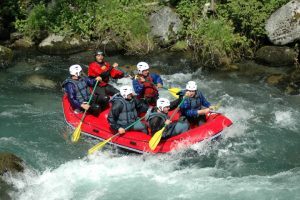 Adrenaline junkies can challenge themselves rafting, canoeing, kayaking, riverboarding and canyoning in the snowmelt-swollen rivers that flow down from the high mountains. Then there’s rock climbing, via ferrata, offroad scooter, caving and paragliding and all of the following fun-filled activities that you can enjoy from April through to October. 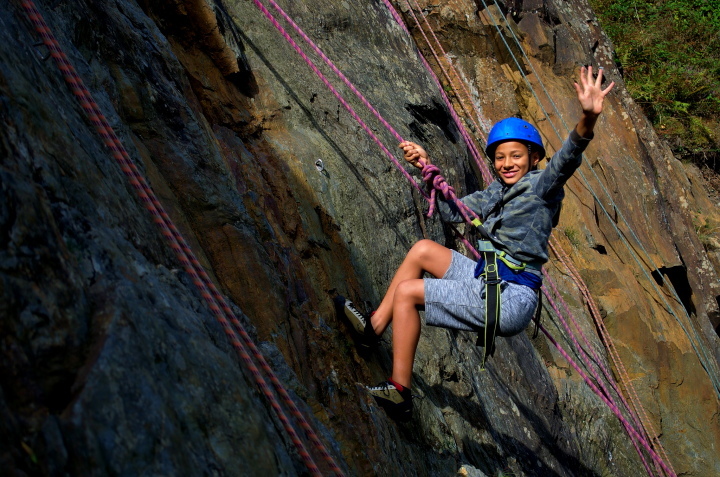 Choose a week long multi activity adventure holiday and we’ll include 9 activity points in the package price. You can exchange these for a whole range of exciting activities – See the tab above for full details of points required for each activity. You think you’ll need more points? No problem, you can purchase additional points if you wish. Whether you’re a family looking for a fun-filled summer multi activity holiday with your adventurous children or a group of mates wanting an action-packed adventure short break together, you know you can trust us to create a fully flexible multi activity holiday that ticks all your boxes. What’s more, you don’t even have to all do the same activities. That’s the beauty of our fully flexible activity points system. Pool the points and share them out amongst the family. As for accommodation, again we give you a range of accommodation options to choose from. Whether you’d prefer to stay in a mobile home or chalet on a 4* campsite, a self-catering property in a mountainside hamlet, a cosy B&B or even a 3* hotel in town, whatever your budget, this tailor made holiday will be created around your wishes. Give us some brief details on the enquiry form on the right hand side of this page and we’ll get back to you with some options for your holiday. 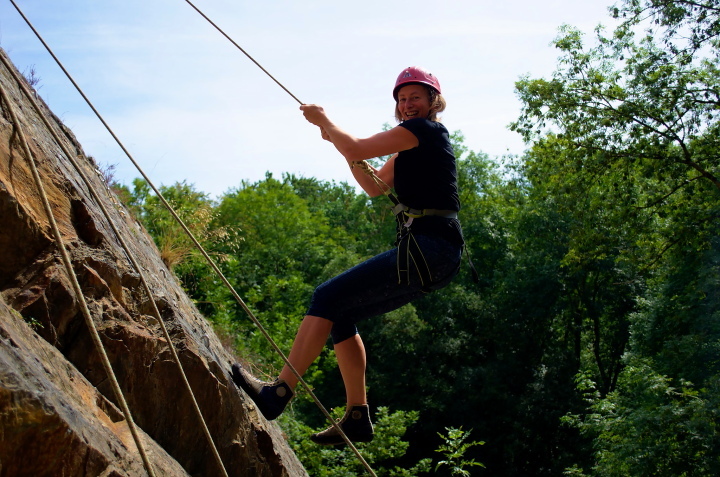 Choose a 7 night multi activity adventure holiday and we’ll include 9 activity points per person in your quote. If you book a 2 week holiday we will include 14 points. If you’re looking for a short break or long weekend then we’ll include anything from 4 to 6 points per person. You can exchange those points for a whole host of fun and action-packed activities. Want to know what you get for your points? Here’s your summary. You don’t need to choose your activities straight away. Take your time and let us know your choices 6 weeks before your holiday. You don’t even have to all choose the same activities. Pool your points and decide how you’d like to split them up between your family/group members. How’s that for flexibility! Leave behind all thoughts of Facebook and enjoy a good hike up to a mountain refuge where you’ll be rewarded with a hot meal and a comfy bed for the night. The catered mountain refuges are generally open from June to the end of September. Exact dates vary per refuge and we will advise you when you enquire. Adult Half Board 2 Points Experience mountain life with a good hike up to a mountain refuge (self-guided) where you can eat delicious food prepared from local products. Facilities are naturally basic up in the mountains. You’ll sleep in dormitory style accommodation with other hikers and showers may or may not be available depending on refuge choice. The walks up to the catered mountain refuges vary in distance and difficulty but don’t worry, we’ll make a refuge recommendation based on your hiking ability. Count on 2-3 hours minimum with height gain of around 800m. The half board option is for dinner, bed and breakfast. Child 12-18 Half Board 1.5 Points Children benefit from a reduced half board (dinner, bed and breakfast) rate when they stay in a catered mountain refuge. Note that in view of the amount of ascent included the walk up to the refuges, this experience is reserved for active childen of 12+ who are used to walking. Child 12-18 Full Board 2 Points Children benefit from a reduced full board rate when they stay in a catered mountain refuge. 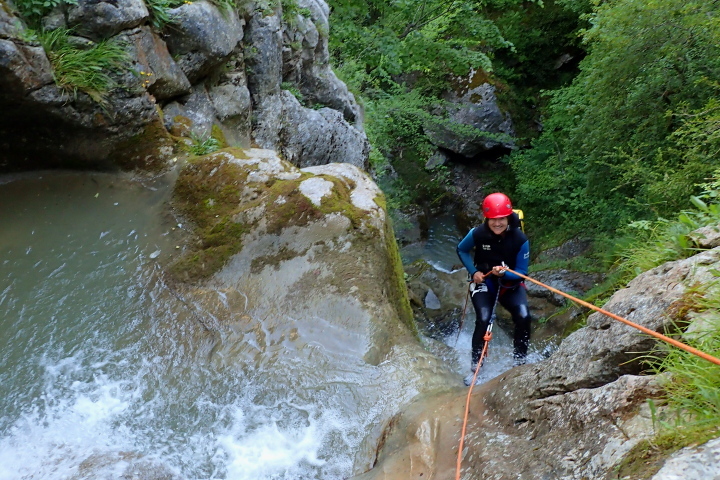 Guided canyoning in the Pyrenees is an activity available to families and individuals alike. 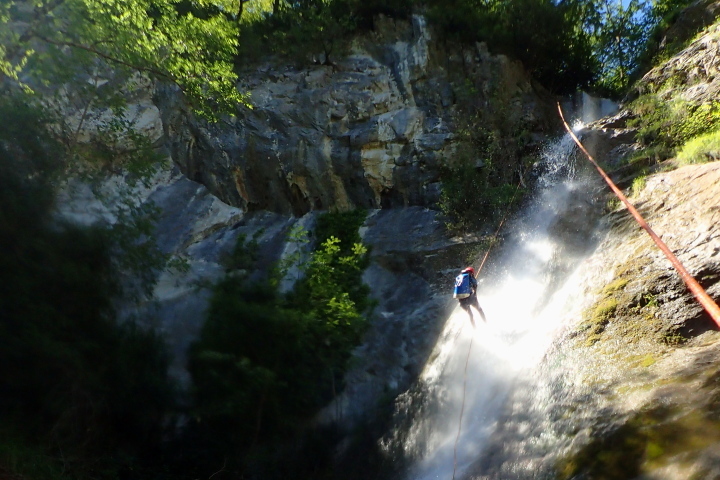 Options range from short kiddie canyons, which are ideal for those new to this activity, right up to day long technical canyoning descents for adults only. You’ll obviously need to know how to swim and, for the bigger canyons, previous experience of rope work such as abseiling is an advantage. 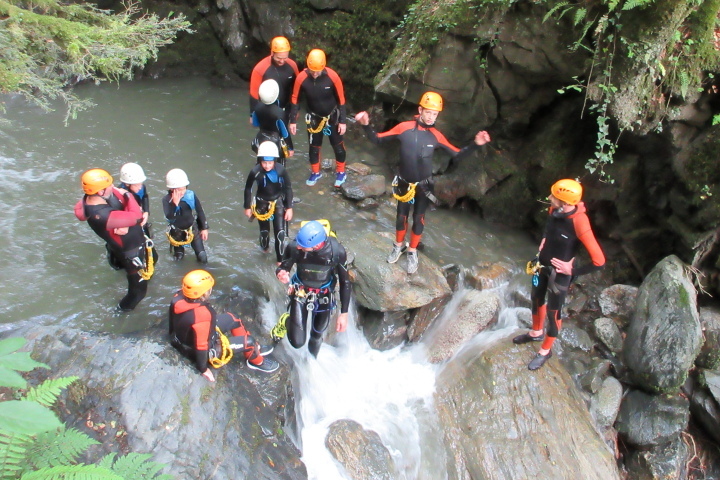 Introduction to Canyoning 1.5 Points The introductory canyoning descents take no longer than 1h30 and include natural slides, short abseils as well as jumps into rock pools up to 2m deep. There are always options for those who are not quite so brave, but I think you will surprise yourself! This activity is suitable for children over 140cm in height who are able to swim. 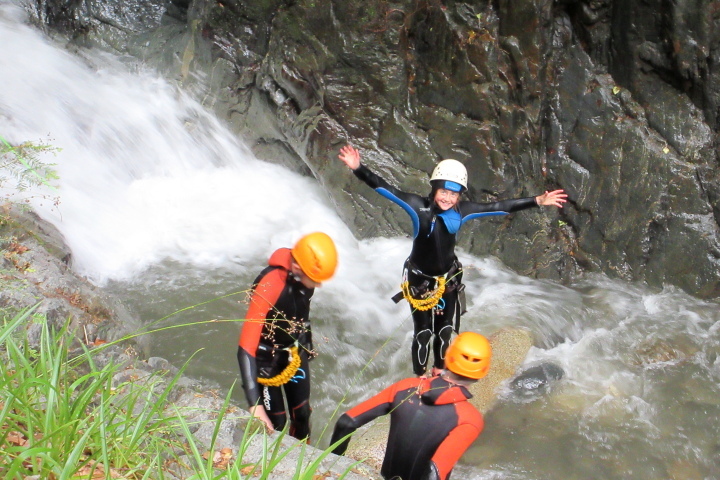 1/2 Day Guided Canyoning 2 Points A descent of a river gorge up the Oô valley near Luchon includes a good stiff 20 minute walk up to to the jump in point. The canyon has numerous abseils, a Tyrolean traverse, slides and jumps into pools from heights of between 4 and 9 metres. All this will take you between 2h and 2h30. 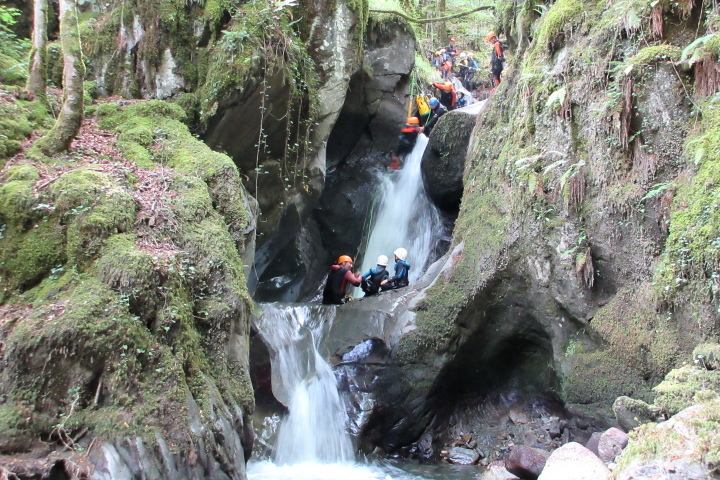 This canyoning experience is suitable for children aged 12+. 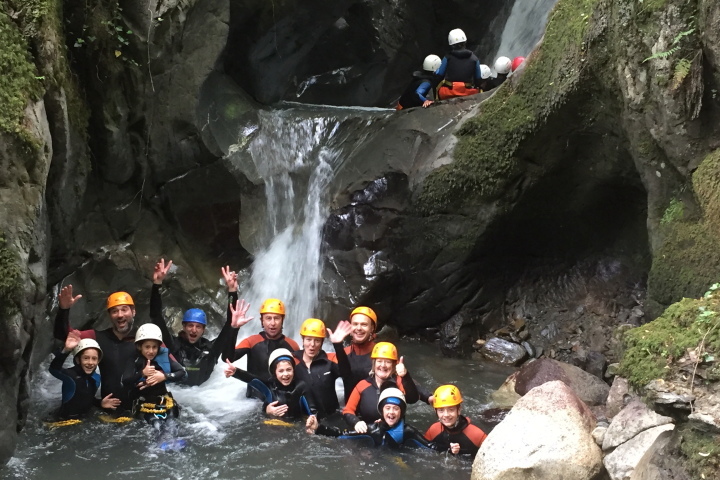 1 Day Canyoning Experience 3 Points Enjoy a full day out and drive over the border into Spain to discover the fabulous Miraval limestone river gorge. The beautiful drive there will take around 1h45 from Luchon but it’s all part of the adventure! 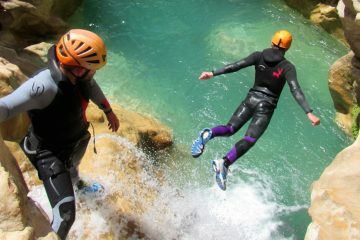 The canyoning descent is open to all abilities as none of the numerous jumps (some from a height of 10m!) and slides are obligatory. 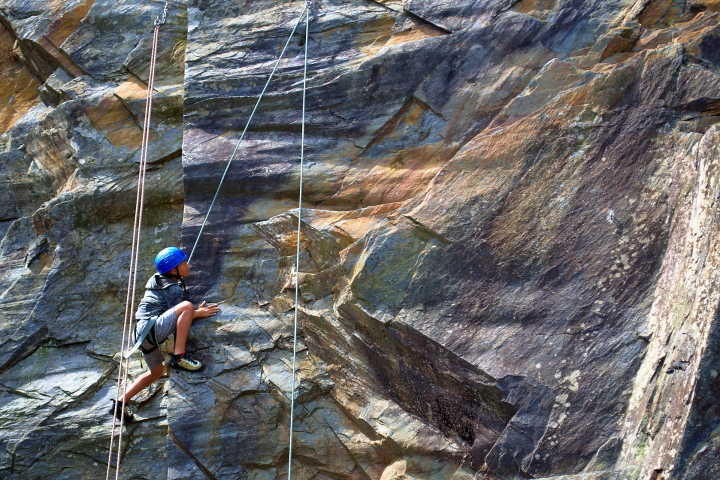 There’s no abseiling or rope work so younger children will enjoy the experience provided they are good swimmers. There is however plenty to challenge older children as they make their way down river! 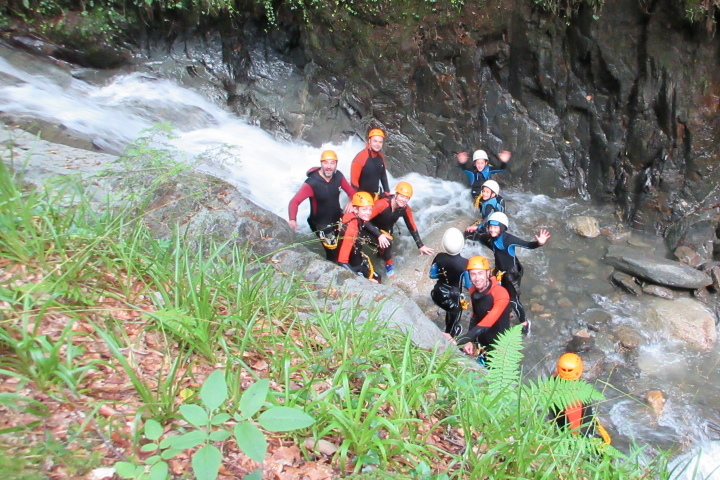 This canyoning experience is open to children of 8+. 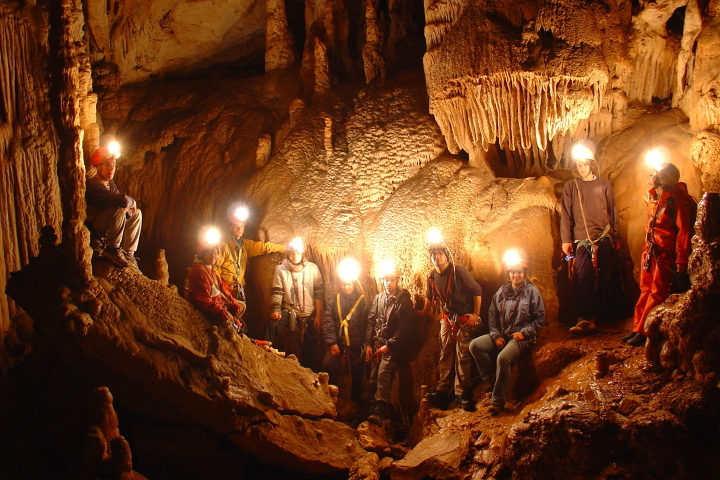 Explore the fantastic underground world of the limestone cave systems in the foothills of the Pyrenees. Marvel at stalactites and stalagmites and a whole range of limestone features as well as surprising animal and plant life in the caves. 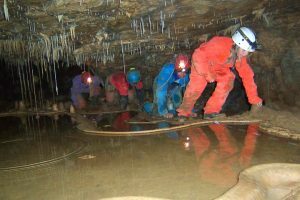 1/2 Day Guided Intro to Caving 2 Points The underground world in the Pyrenees is an environment of fantastical limestone formations, underground streams and rivers and otherworldly creatures, sure to capture the imagination of adults and children alike. 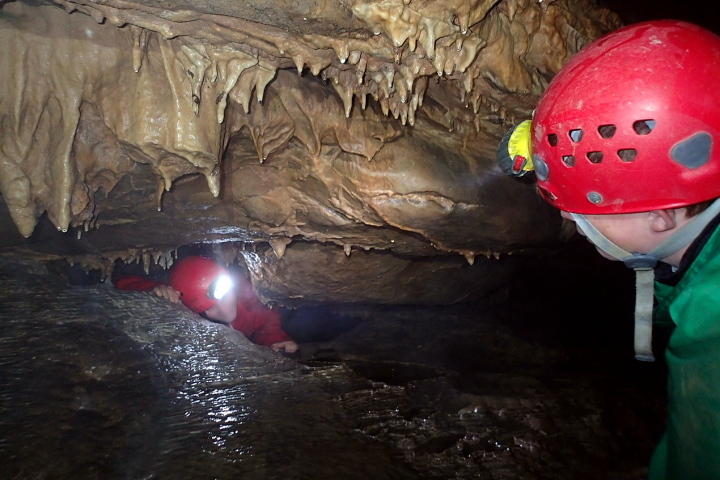 No need for ropes or any other technical equipment on this introduction to caving. This activity is open to everybody, has no technical difficulties and is of course practicable in all weathers! The only proviso is that larger people may struggle with some of the narrow passages. This introduction to caving experience is suitable for children as young as 5 yrs. 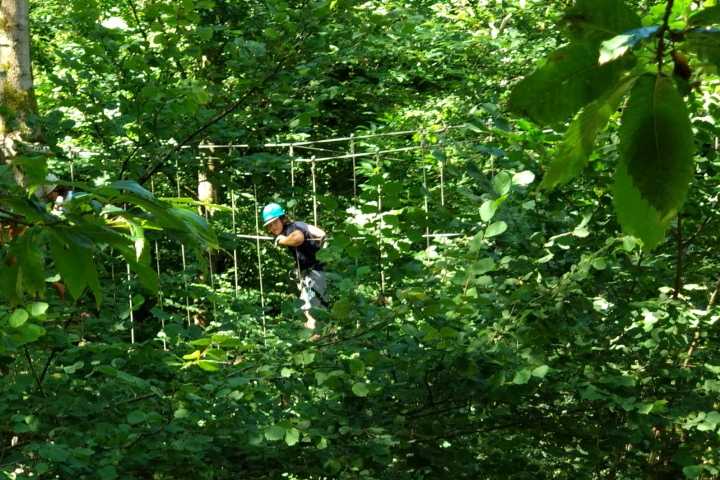 Challenge yourself on giant Tyrolean zip wires, monkey bridges and via ferrata on a high ropes adventure. 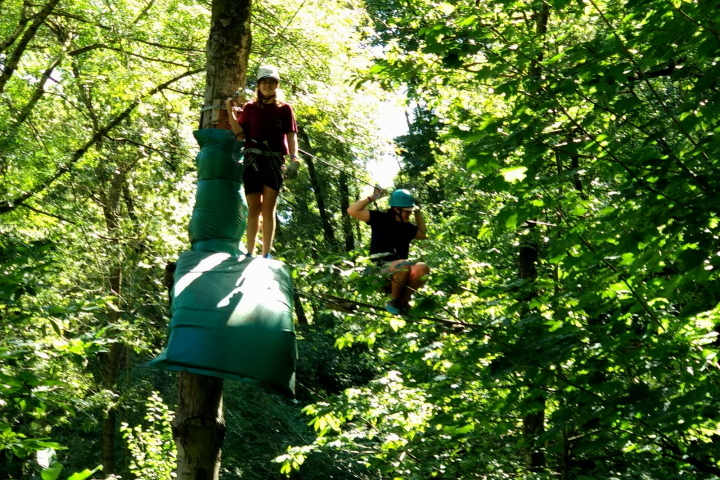 From a half day guided high ropes adventure to a full day self-guided at a local adventure park, this is serious fun for all the family. The points you choose will depend on where you will be staying for your adventure holiday. We will advise you on the best options available. 1 Day Pass – Pyr Hô Adventure Park 1 Point If you’re staying in the Luchon area then the Pyrenees Hô adventure park has to be one of your activity choices! With over 220 aerial and 20 ground based activities it is a great day out for both adults and children from 3 years upwards. 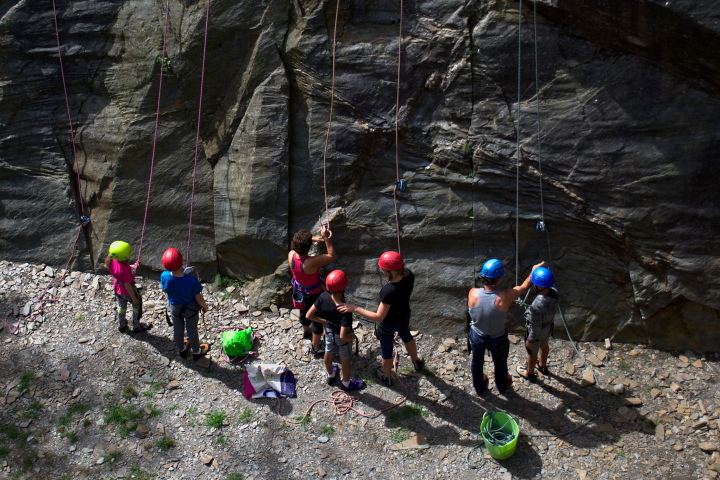 Tyrolean traverses, cargo nets, pedal cart and biking circuits, giant slides, cable bridges, climbing, via ferrata…. whichever course you do, the activities get progressively more difficult in order to continually challenge you. For a small extra charge, the bravest may choose to the free jump onto the massive inflatable mattress or fling yourself down the giant Tyrolean! 1/2 Day Guided – Roc Aventure 2 Points If you’re based in the Ariege Pyrenees then the Roc Aventure high ropes adventure park is great fun. 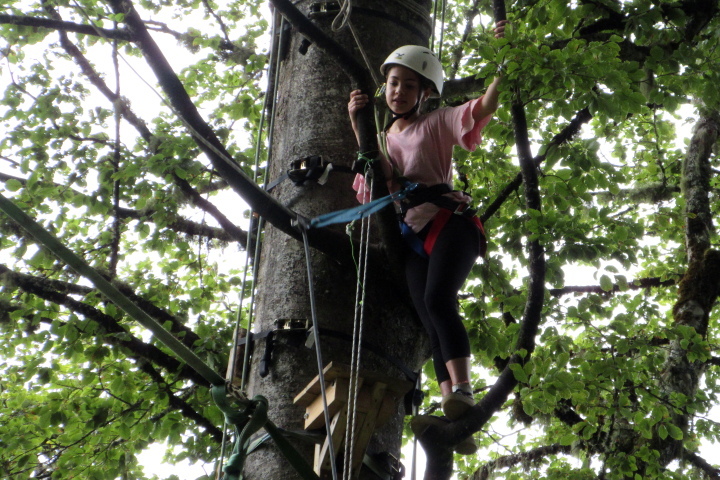 This guided activity is suitable for anybody over 1.35m provided they have a head for heights! The park is in a completely natural and wild setting above one of the rivers that are used for the canyoning activity. 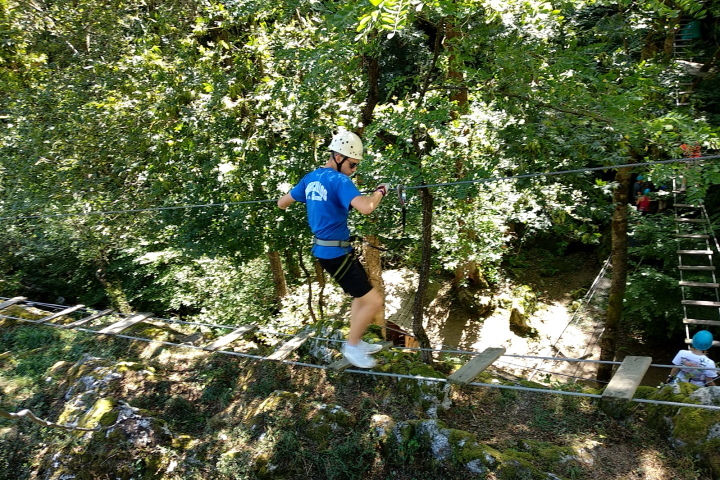 This is a great mixture of via ferrata, monkey bridges, cable crossings and exciting Tyrolean traverses (the biggest is 200m long!) which take you from side of the river to the other. Your balance will be tested but you are securely attached to the guide line at all times. The activity is modular and lasts between 2 and 3 hours. 2h Horse Ride for Novices 1.5 Points This gentle 2 hour ride out is the perfect introduction to horse riding for those who have never been on a horse before. Your local guide will initiate you into the basic skills needed for horse riding with children riding a pony and adults a horse to suit their height. This activity is open to children over 8 years. Note that the horse riding is not suitable for people who weigh over 80kgs. 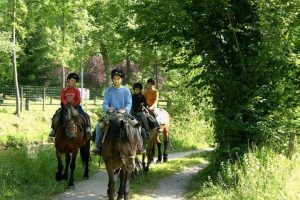 1/2 Day Horse Ride 3 Points If you have previous horse riding experience, this 1/2 day ride is the perfect opportunity to get to know the local Merens or Castillon breed of horse and to explore some of the quiet paths and tracks of the Pyrenees mountains and foothills. 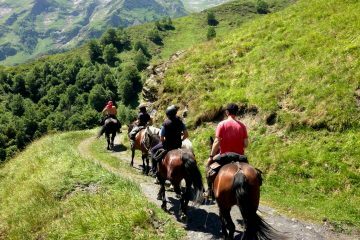 Full Day Horse Riding Experience 4 Points Experienced horse riders who are already used to long hours in the saddle will love these day treks which provide a great opportunity to discover the full beauty of the Pyrenees foothills and mountains. With 6+ hours in the saddle, this is a grand day out. You’ll be accompanied by an experienced local guide and will head off the beaten track along little explored paths, up cooling rivers and onto mountain ridges. It’s a wonderful horse riding experience. 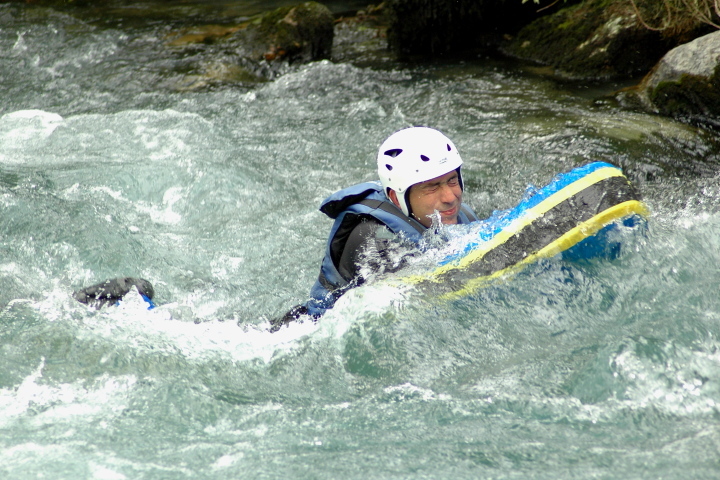 Riverboarding is known as Hydrospeed in France and is a fun riversport for the confident swimmer. 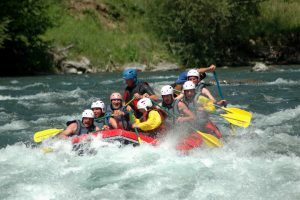 It is practised on most of the rivers that flow down from the high mountains of the Pyrenees and is a challenging and adrenalin-fuelled activity, especially in the spring time when the rivers are super-charged with snow melt. Intro to Riverboarding 2 Points The introduction to riverboarding session is fantastic fun for confident swimmers. The descent lasts for approx 1h30 and may include some small weirs and mini rapids that form where the river narrows. Ths activity is suitable for children over 13. 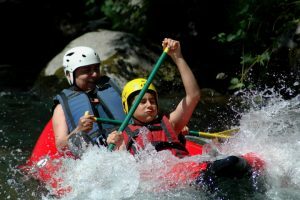 1/2 day Riverboarding Descent – Bossost in Spain 3 Points For maximum adrenalin, your descent of the river Garonne from Bossost in Spain will be timed to coincide with the release of water from the hydroelectric reservoirs up river. Hold onto your riverboard and go with the flow! This descent is for strong, confident swimmers over the age of 15 who ideally have previous riverboarding experience and are capable of withstanding a fairly sustained effort for the duration of the descent. 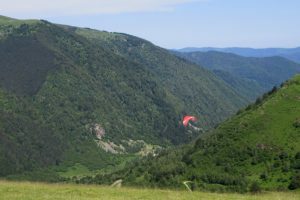 Tandem and solo paragliding experiences in the French Pyrenees in which spectacular views are guaranteed. 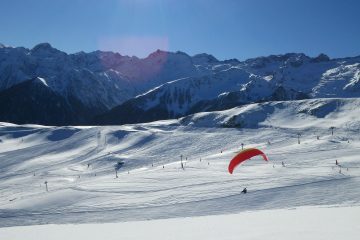 Paragliding outings are obviously very much subject to the weather conditions on the day. 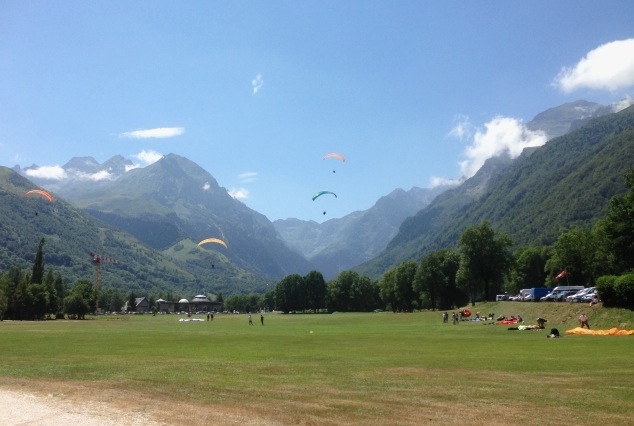 Fancy a permanent record of your paragliding outing? Ask us to reserve the GoPro for you and you can take the memory card home with you after your flight! Tandem Paragliding 4 Points We have a couple of take off sites for the paragliding experience. One is the Superbagneres ski station above Luchon and the other from the Col d’Azet above the stunning Louron valley. Both options will give you some of the most dramatic and spectacular views of the high mountains. You’ll have around 20 minutes in the air. 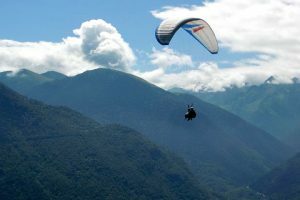 The tandem paragliding experience is open to children as young as 5 years. 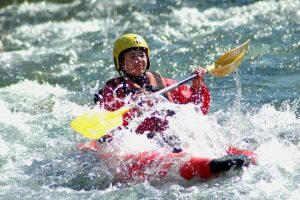 Kayaking on the rivers of the French Pyrenees in Spring is a great fun activity for all, especially in springtime when the snow melt swells the rivers. 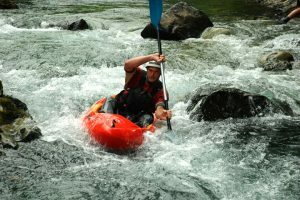 Choose a 1 or 2 person canoe kayak and then after a briefing from your instructor you’ll set off down the river using your paddle and bodyweight to steer. 1.5h River Kayaking 1.5 Points The Garonne river is the location for this self-guided river kayaking experience which starts from the village of Valcabrère in the Comminges foothills. 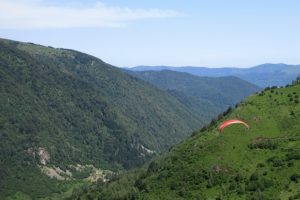 This should be your choice if you’re staying in the Luchon area of the Pyrenees. Numerous tributaries flow into the Garonne which means it always has a reasonable water level. It is at its most exciting in Spring and early Summer but continues to have a steady flow all through the summer. Individual kayaks and two person canoes are available. You are free to stop off en route down the river for a picnic lunch before arriving at the end point from where the minibus will pick you up and return you to base. 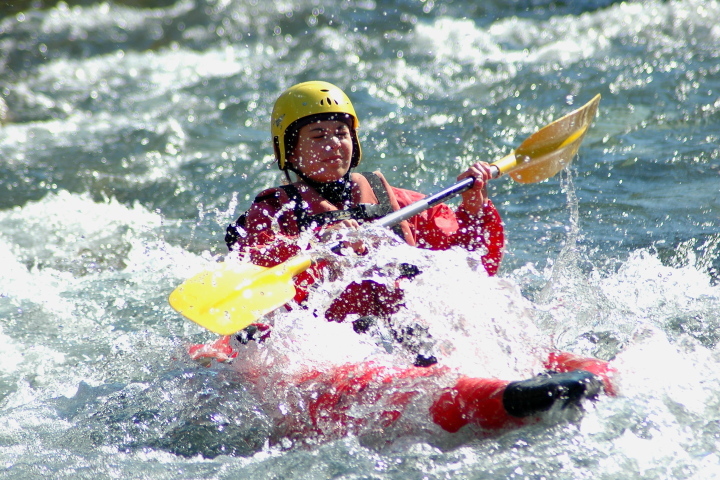 The river kayaking experience is available to children aged over 10 yrs. 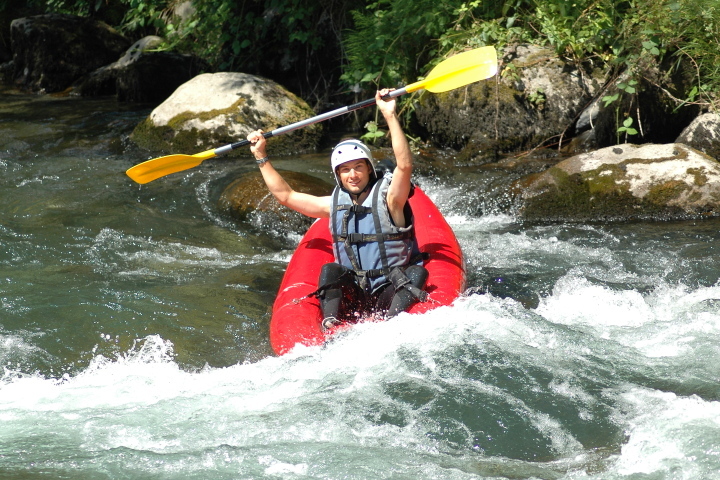 1.5-2h Kayaking Ariege 1 Point For those staying in the Ariege Pyrenees, this 1.5-2h descent of the river Salat from just up river of the village of Seix should be your choice. You’ll be accompanied by a qualified guide as you make your way down river. A minibus will transfer you back to base from the exit point. River rafting is fantastic fun for families and also groups of mates, especially in the springtime when the snowmelt swells the rivers. In the peak summer months the river levels drop and a calmer descent is assured. 1/2 day Rafting or Inflatable Canoe 2 Points We use a couple of locations for the 1/2 day river rafting descent. The wide River Garonne that flows down from the Aran Valley in Spain is great fun in the Spring but much calmer from August onwards as river levels drop. 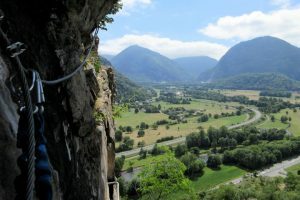 A sporting descent on the picturesque river Arreau further west is assured by the presence of the Gorges de Cadéac, a point where the river narrows and you are ‘posted’ through the gap! 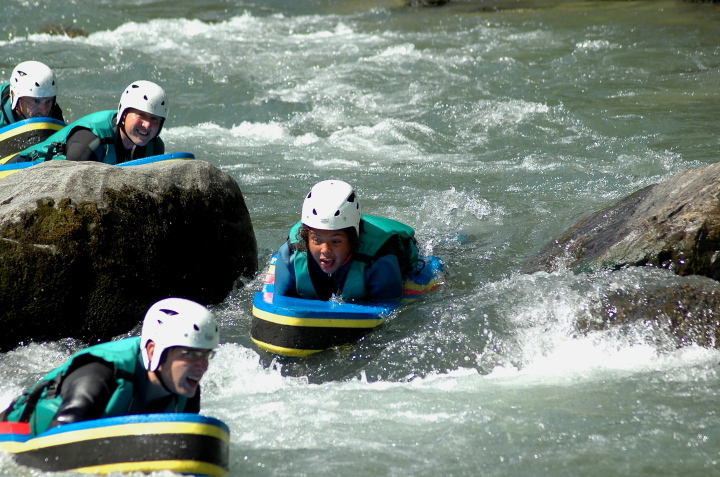 Whether you choose a descent in a multi-person raft or a 1 or 2 person inflatable canoe, a fun time is assured. Suitable for children over 5 years. River walking is a great way to cool off in the heat of the summer months. Your guide will choose the river according to conditions on the day. 1/2 Day River Walking Experience 1 Point Enjoy a refreshing walk up a river course on a hot summers day and discover the flora and fauna of a unique environment. Your local and experienced guide knows the river courses well and will select the best outing for your group based on conditions at the time. You can expect to be river walking for around 2.5 hours. The points indicated apply for 4 or more people. For smaller groups, the activity will be 1.5 points. The river walking experience is suitable for children aged 7+ provided they can swim. 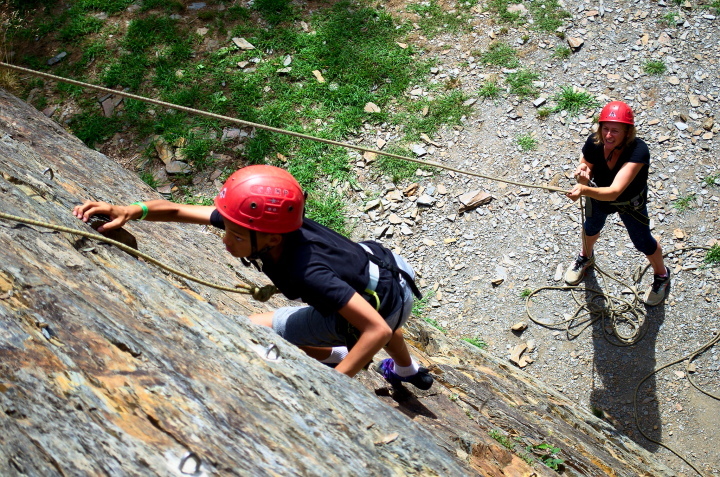 Go rock climbing in the Pyrenees and enjoy warm rock in a beautiful environment. Single pitch and multi pitch sports climbing for all abilities. 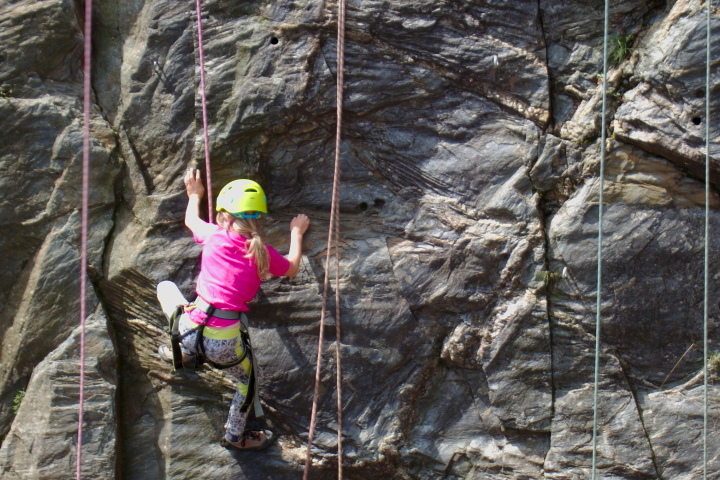 Children from aged 6 or more relish the mental and physical challenge of rock climbing as they try and work out the foot and hand sequences to climb up the rock face. 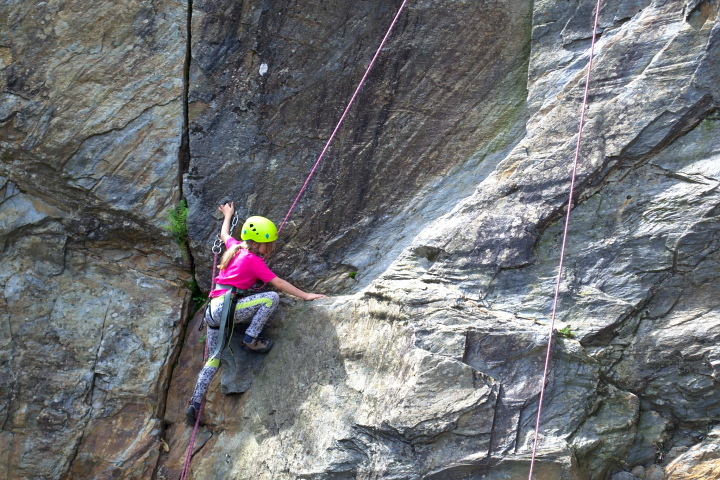 1/2 Day Guided Rock Climbing 2 Points This 1/2 day guided rock climbing experience is a great introduction to the sport and a fantastic activity for the kids. You’ll learn all about the equipment needed to climb up a rock face and how to tie the specific knots that will attach the rope to your harness. 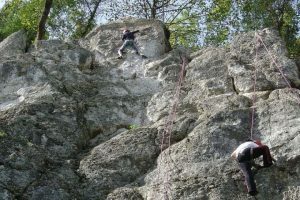 Your guide will then belay you as you make your way up the warm rock face, using natural hand and foot holds in the rock. 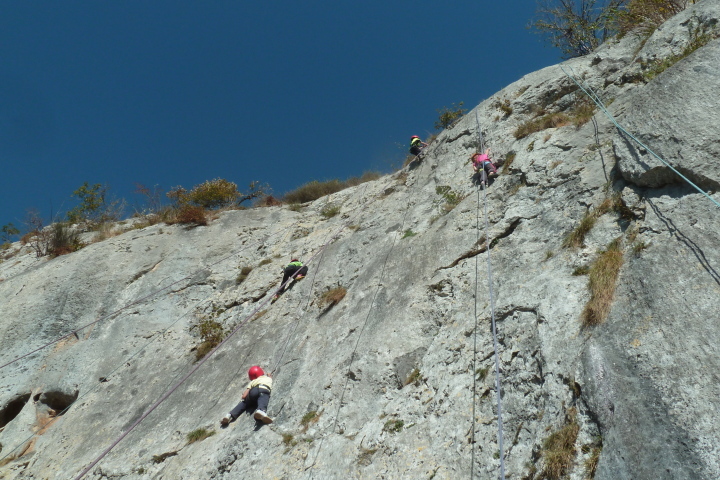 You’ll get a real sense of achievement when you reach the top and your guide lowers you down using the rope! The points indicated apply for 4 or more people. For smaller groups, the activity will be 2.5 points per person. 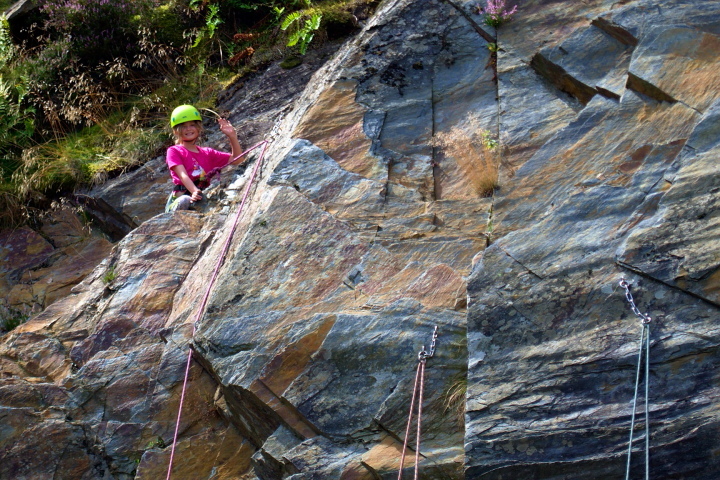 Rock climbing is suitable for children aged 6+. 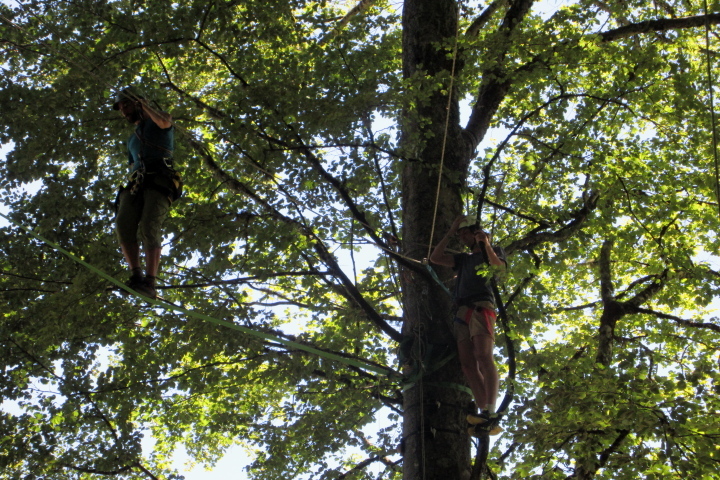 Go tree climbing on your multi activity adventure holiday and rediscover the little monkey in you. Great fun for all the family. This activity is suitable for children of 6 years and upwards and is only available in July and August. 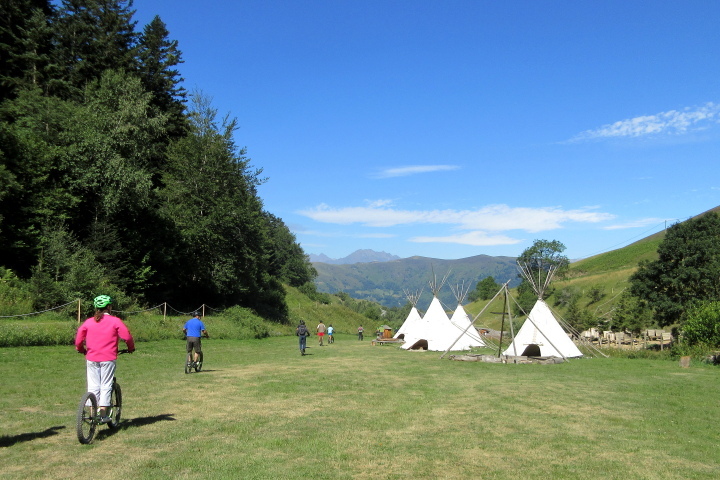 It takes place in the welcome shade of the trees near the le Mourtis ski resort. 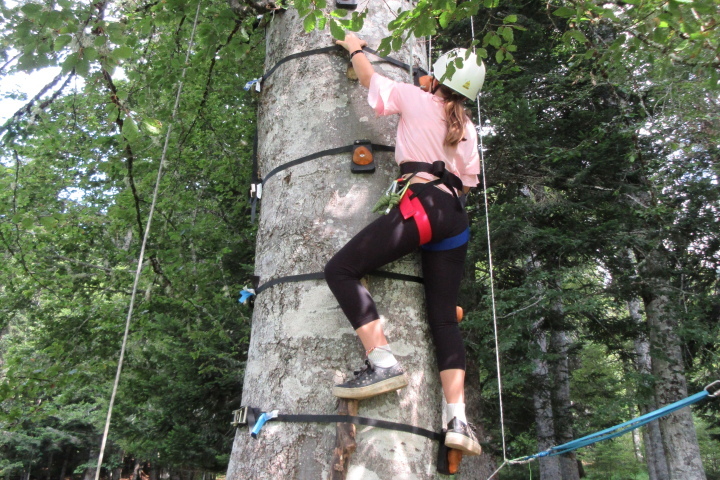 1/2 Day Guided Tree Climbing 1 Point On this group activity you’ll learn basic rock climbing techniques and apply them as you climb up into the trees. You’ll be securely attached to a rope at all times. 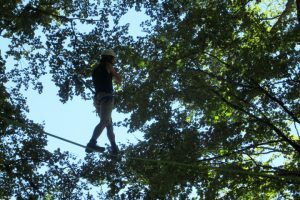 Play on the Tyrolean traverse, challenge your balance on the slackline in the tree canopy, let yourself go on the rope swing. 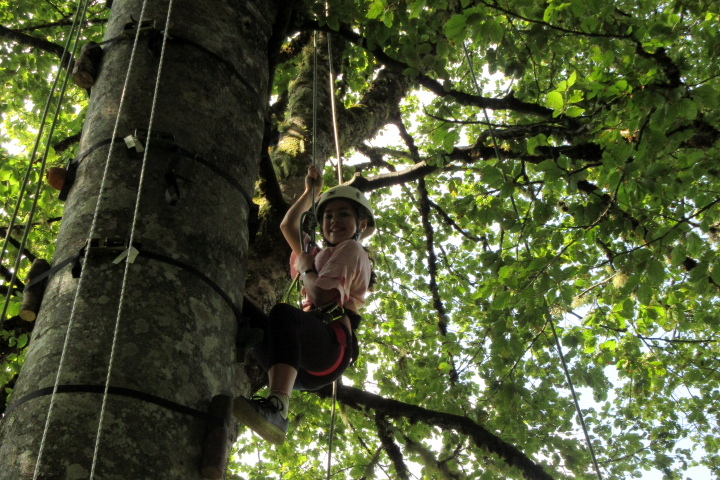 Kids young and old will love tree climbing! Minimum numbers may be required for the points indicated to apply. 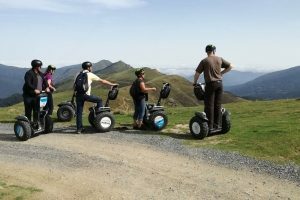 The offroad scooter is a great new guided activity in the Pyrenees. 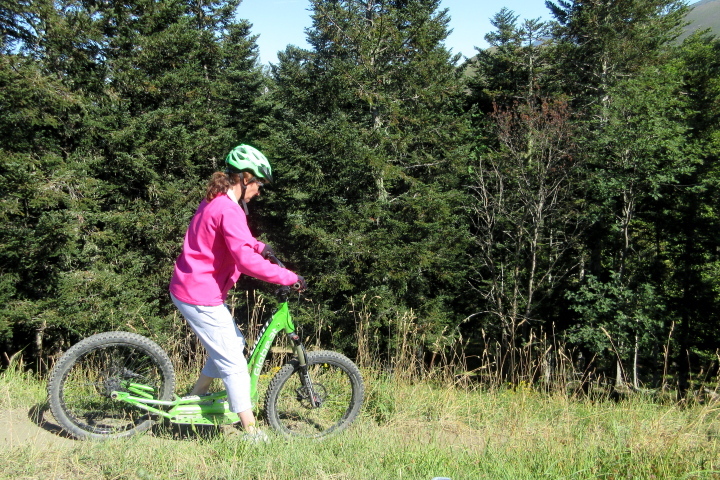 It’s a cross between a scooter and a mountain bike and may be equipped with suspension for a smoother ride. 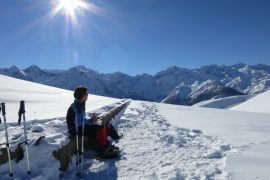 You’ll explore the paths and tracks that descend from up near the Peyragudes ski stations and enjoy a fun morning or afternoon with all the family. 2h Offroad Scooter 1.5 Points From your meeting point in the valley floor you’ll be transported up to the starting point for your offroad scooter descent. You’ll be thoroughly briefed on how to handle the scooter but don’t worry, it isn’t difficult, although it will feel strange initially! You’ll then ride back down to the valley floor on forest paths and tracks, stopping to take in the views as you go. Helmets will be provided by your guide. The offroad scooter experience is suitable for children of 11+ years. The all-terrain Segway is a one-person self-stabilized electric scooter type vehicle with two parallel wheels which works via a system of very sophisticated gyroscopes and sensors to give you perfect balance when stopped or while moving. It’s really easy to learn as it reacts instantly to any inclination of the body. Lean forward to go forward and lean back to slow down and to steer you just turn the frame. The offroad Segways have chunky tyres which give you great offroad grip. You can even go uphill with no effort at all! You need to weigh a minimum of 45kgs to safely use the Segway so this activity is not open to younger children. 3h Offroad Segway 3.5 Points This half day outing is a great way to explore some of the higher paths, tracks and trails in the area with barely any effort. You’ll meet your instructor at the meeting point and be given a briefing on how to use the Segway. Then it’s off you go to discover the beautiful mountain environment around Luchon. Anybody who weighs over 45kgs can enjoy an offroad Segway outing. 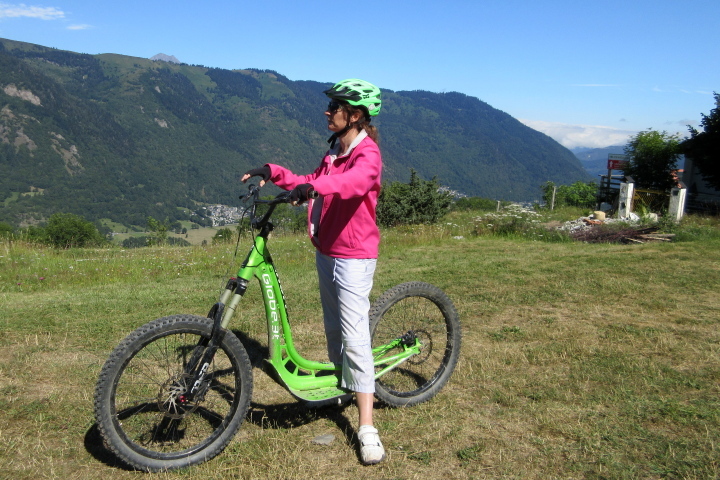 1h30 Offroad Segway 2 points This shorter introduction to the offroad Segway will take you onto the tracks and trails above a little mountainside village from where the most spectacular views of the high mountains surrounding Luchon open up before you. 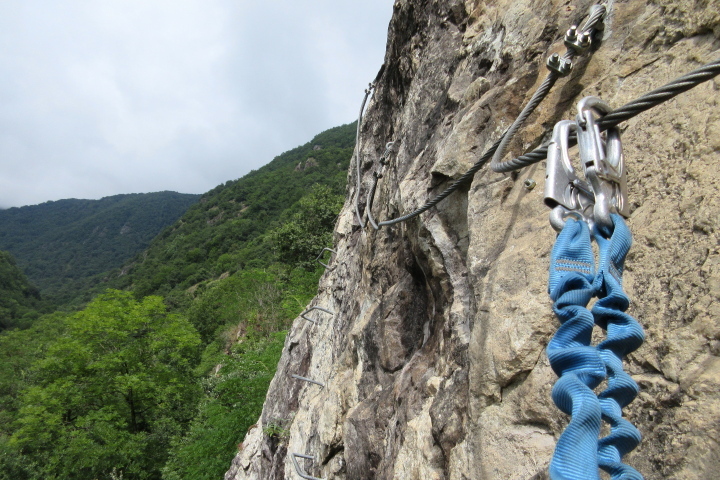 Via ferrata means iron path in Italian. 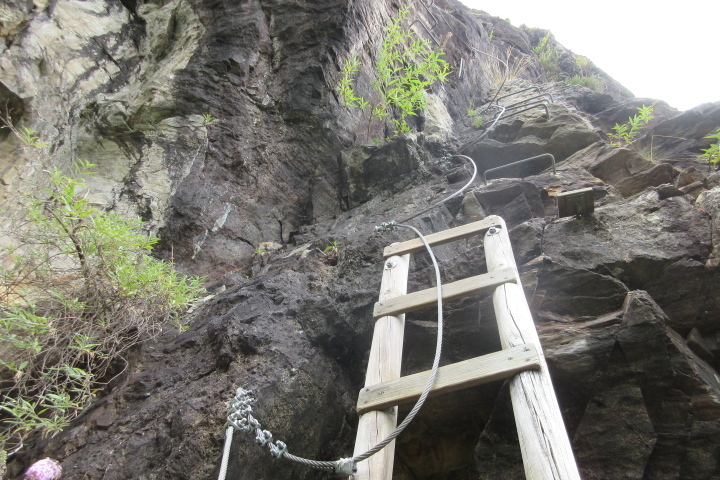 It is a mountain climbing route which consists of anchors such as steel cables and rungs, steps and wooden walkways. 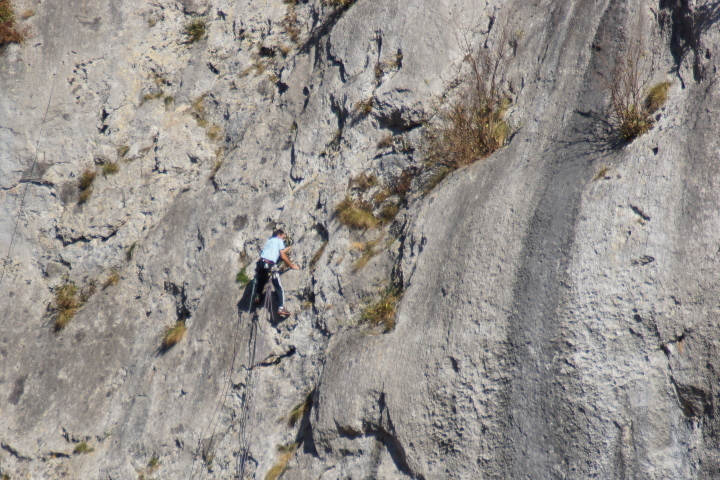 Wearing a rock climbing harness, you affix yourself to the guide cable and make your way up and along the rock face. 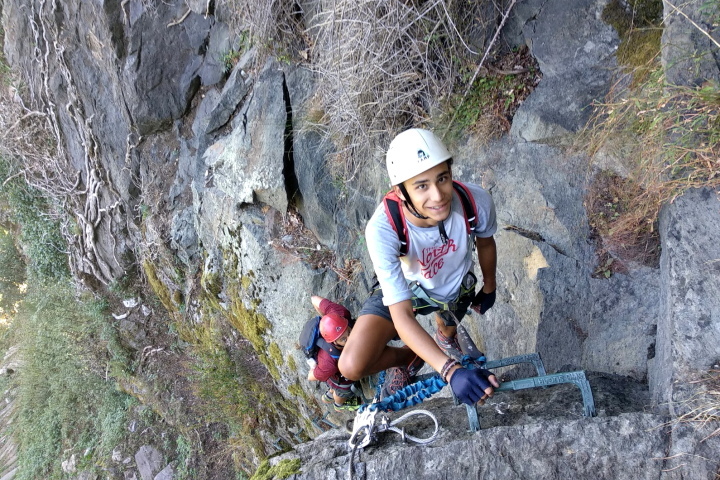 Via ferrata is a great adventure for those with a head for heights. It’s great fun for children of 12 years and up. The incredible views and sense of achievement you will get on completing the route makes the effort worthwhile. Via Ferrata Cierp Gaud 1 Point The via ferrata course at Cierp Gaud can be done self-guided provided there at least 2 of you and will take you 1h30-2h. It’s a real challenge and a great choice for anybody wanting to have an adventure in a beautiful setting with great views. You will need a head for heights for this course! An instructor will provide you with the necessary safety equipment and brief you on the techniques required to complete the via ferrata circuit. Then it’s over to you! 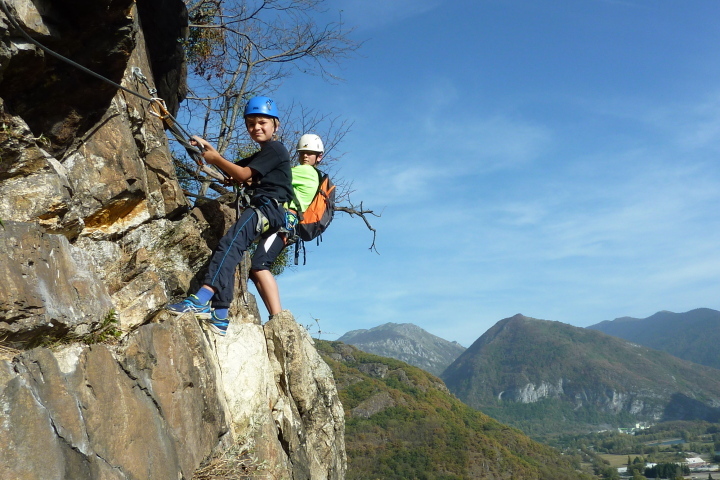 Via ferrata is suitable for children aged 12+. 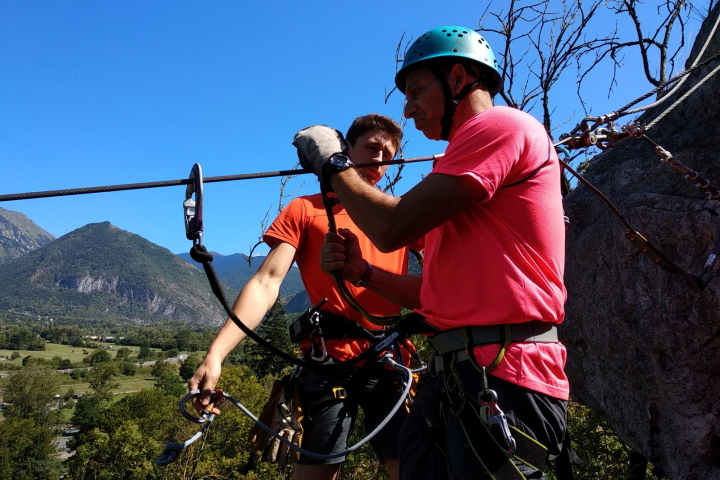 1/2 Day Guided Via Ferrata 2 Points This 1/2 day guided via ferrata is open to people of all abilities, both those who have got previous climbing experience as well as people who are completely new to the sport. Your head for heights will be challenged on the exposed sections but you will be securely attached at all times. 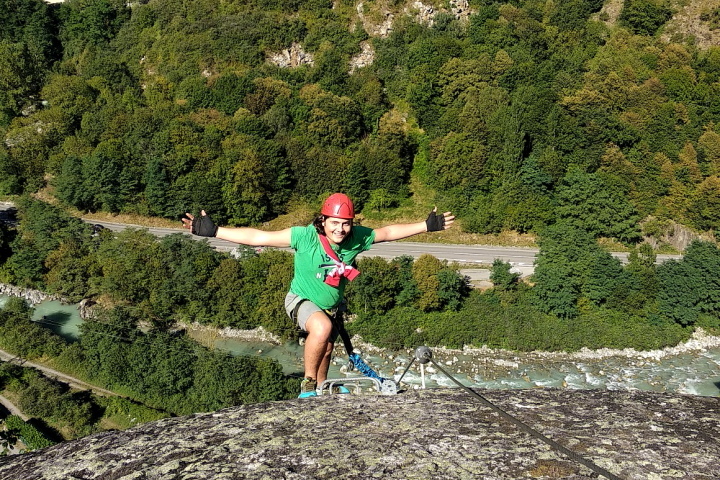 This via ferrata experience is available to children aged 12+. 1 Day Guided Via Ferrata 3 Points You will need a certain level of fitness to undertake the full day ferrata just across the border up the Aran valley in Spain. It involves a good walk in and is a long outing. The minimum age is 12 years. 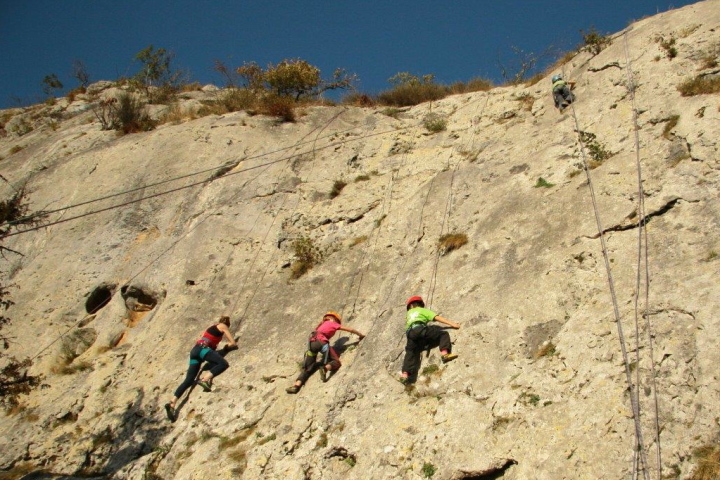 The via ferrata gets progressively more difficult but there are get out points should you not feel able to push yourself further. A grand day out! 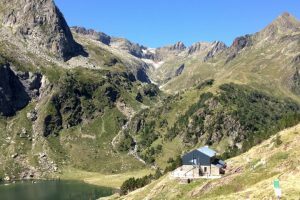 Explore the beauty and grandeur of the Pyrenees mountains on a self-guided or guided walk, discovering the rich mountain heritage, culture, flora and fauna of the mountain environment. There is walking for all abilities and the mountain views will take your breath away. 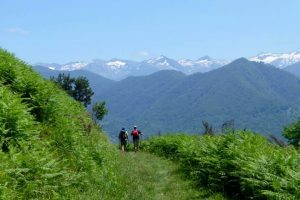 1 Day Guided Mountain Walking 2.5 Points A full day of mountain hiking, adapted to your level, in the company of an expert local guide is the best way to explore off the beaten path and to discover the remarkable flora and fauna of the central French Pyrenees. 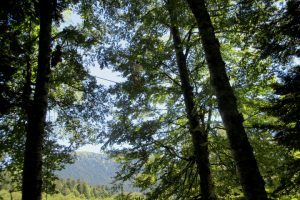 Discover the environment of the brown bear in the Pyrenees, see chamois and red deer and maybe even catch a glimpse of the Lammergeier or the Egyptian vulture in the skies above you. 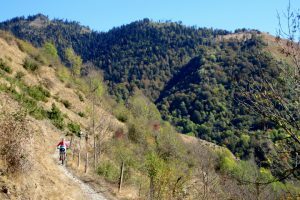 Experience mountain biking in the Pyrenees on way-marked tracks, trails or on gnarly single track with views to die for. Hire a mountain bike and find your own way around or, better still, use a local guide to show you the very best mountain biking in the area. 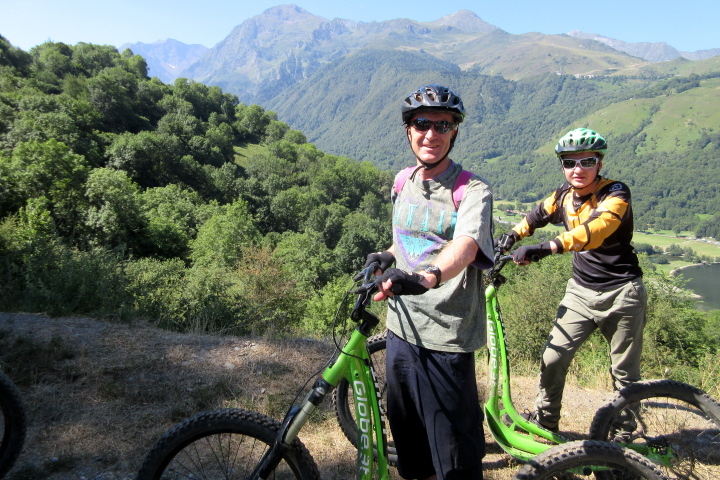 1/2 Day Hardtail MTB Hire 1 point Hire a hardtail XC mountain bike for half a day and explore the tracks and trails of the Luchon area or around the le Mourtis ski station. 1 Day Hardtail MTB Hire 2 Points Same as above but a full day’s hire. 1 Day Full Suspension MTB Hire 3 Points The full suspension mountain bikes are a whole different experience if you are keen to explore the more technical singletrack of the area. Only advised for experienced mountain bikers. 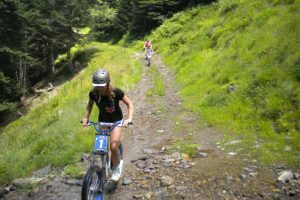 2h Easy Guided MTB 2 Points For ages 7+, your guide will take you on some easy paths, tracks and trails. 3h Enduro Descent 2.5 Points For ages 14+, an ascent on the ski lifts to the Peyragudes ski station for around 1400m of guided descent (intermediate level) back down to the valley floor. Great fun for thos who already practice mountain biking! 1/2 Day Enduro 3 Points For ages 14+, a minibus uplift to a suitable drop off point followed by an exciting guided descent on some of the area’s best singletrack, paths and tracks. 3h E-MTB 3 Points For ages 12+, the e-MTB option is for those who maybe don’t have the fitness or desire to pedal! This 3h guided outing will allow you to discover stunning mountain scenery and charming mountain villages. 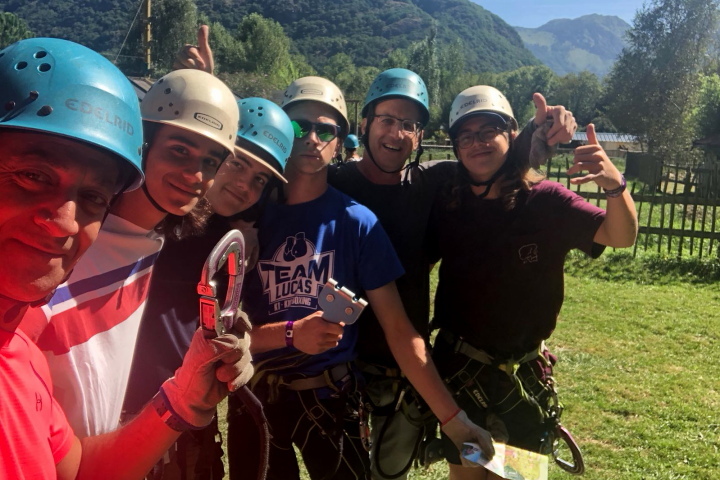 Our week in Luchon was perfect for us and our 10 and 13 year olds. Penny’s brilliant organisation, local knowledge and kindness meant we could cram in loads of exciting stuff without all the stress of putting it together. 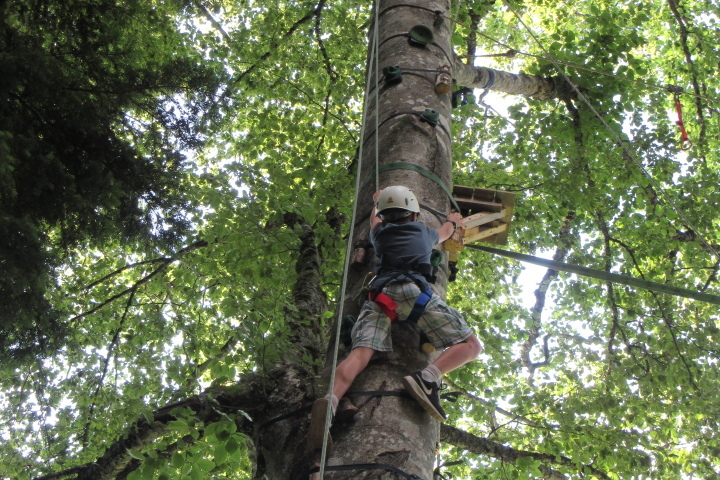 We loved the tree climbing, river boarding, mountain refuge and canyoning. Just a shame the clouds meant we couldn’t go paragliding this time! We loved our week in the Pyrenees. I’ve been coming to the area for a few years now to see friends and had wanted to do more things with the kids (9 and 12). Penny helped put together our activity holiday, water rafting, river walking, rock climbing and horse riding with a bit of jogging and walking and visiting friends thrown in. Information about each of the activities and maps to the places was so useful – what to wear what to bring etc and even recommendations for run routes and places to eat. It made the holiday so much more relaxing and smooth than if I had organised it all myself – and gave me the confidence that activities are well organised and having a personal recommendation from Penny means a lot. She has a great relationship with the locals and operators. ….and I even finished a book! My family and I couldn’t have been more pleased with the Pyrenees vacation itinerary you created for us. All of the guided adventure activities were a big success, and our accommodations were just lovely. Thank you for all your thoroughness, Penny. It was a wonderful week. Would recommend the services of Penny and Adventure Creators to anyone who is looking for a family based activity type of holiday. Everything was well organised and ran like clockwork with lots of detailed information from Penny. We enjoyed the canyoning the most but in honesty the whole weeks worth of activities: cycling. 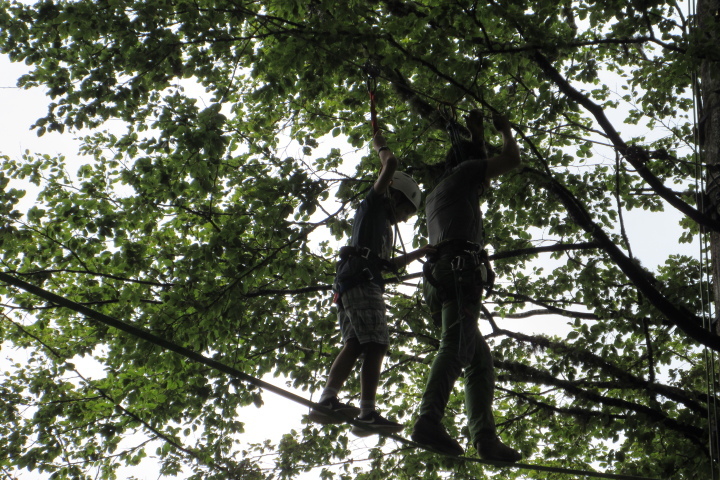 hiking, tree climbing, high ropes and kayaking were all great fun. The location in the Pyrenees was also fantastic with mountains pretty much everywhere you looked. 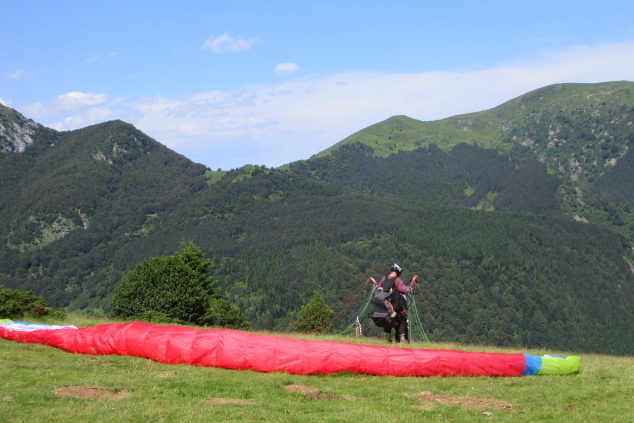 A really great week in the Pyrenees brilliantly organised by Adventure Creators. 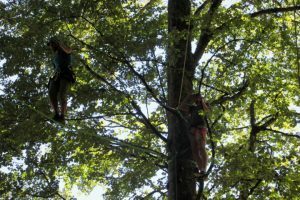 The accommodation was excellent and all of the activities lived up to or surpassed out expectations. Penny was really helpful and welcoming and her organisation was great . A real highlight was the quality or the instructors. All were knowledgeable, competent and a whole lot of fun. If we didn’t live in Australia we’d be back next year! Thank you so much for your kind comments, Ian. It was a pleasure to meet you and an even greater pleasure to see you all have so much fun here! I will of course pass your comments to the accommodation owner and to the instructors too. Keep in touch and hopefully we will see you again at some point in the future. 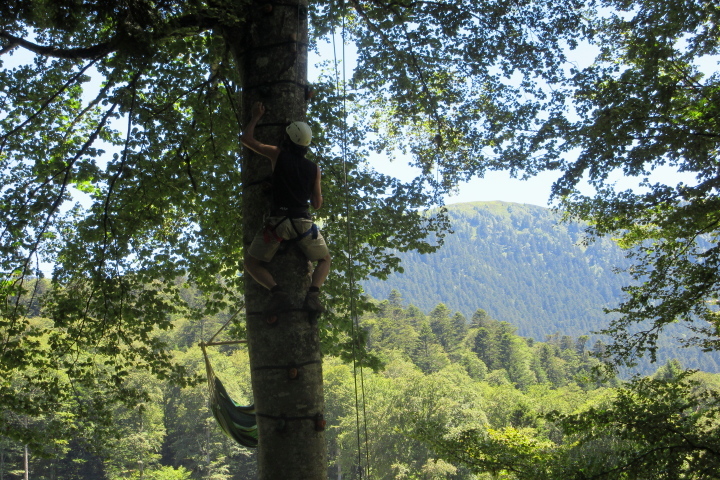 Thank you Adventure Creators for a wonderful week in the Pyrenees. It was all very well organised, and Penny’s local knowledge was really helpful, especially with her great restaurant recommendations. Morning activities were safe and well thought out, and Penny gave us suggestions for where to go in our free time. She joined us for a couple of activities and a meal, and was great company and full of useful and interesting local information. 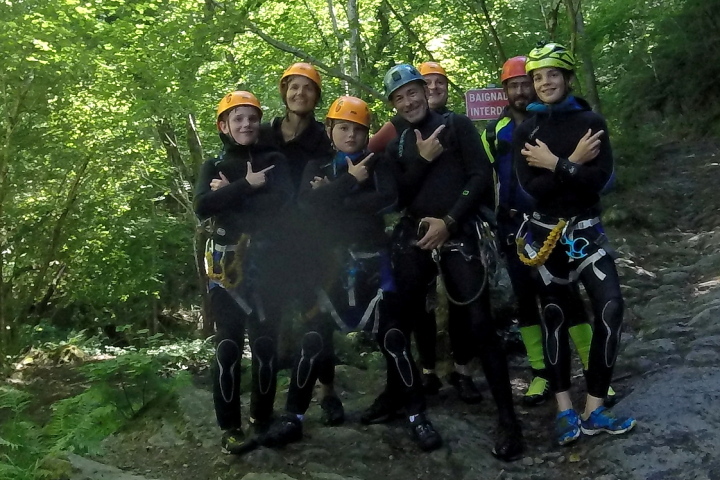 Our group of 2 adults and a teen did white water rafting (quite sedate this year), via ferrata (nice guide and just the right level), rock climbing (beautiful scenery and personal guide, lots of routes for us), high ropes/tree adventure (a fantastic mix of Go-Ape and via ferrata with lots of routes and ability ranges. The 2 toughest routes took us an hour each, and had the most amazing zip wires includied). 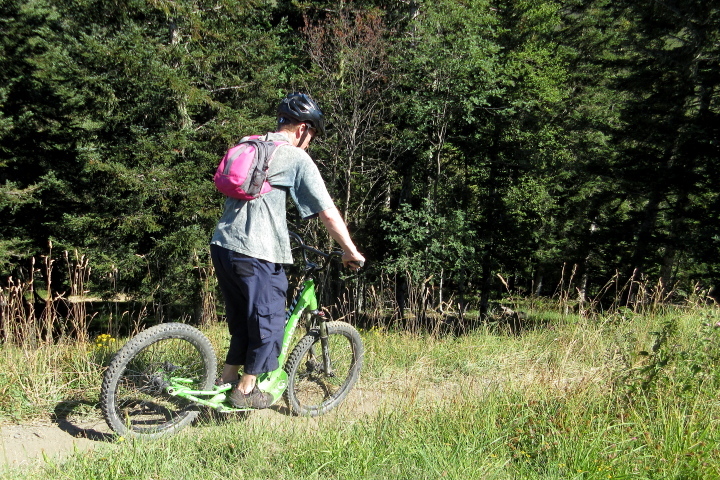 Trotinette – a mad mix of mountain bike and scooter – great fun and I think this was the males’ favourite activity. Fantastic week doing a whole mixture of activities, pitched just right. All the activities went smoothly, great fun, good accommodation, good food, helpful information. Without the pre-organisation there is no way that we would have done all the activities or had such a relaxing and pleasantly distracting week. Beautiful setting – hoping to come back for more. Great trip and didn’t want to come home! 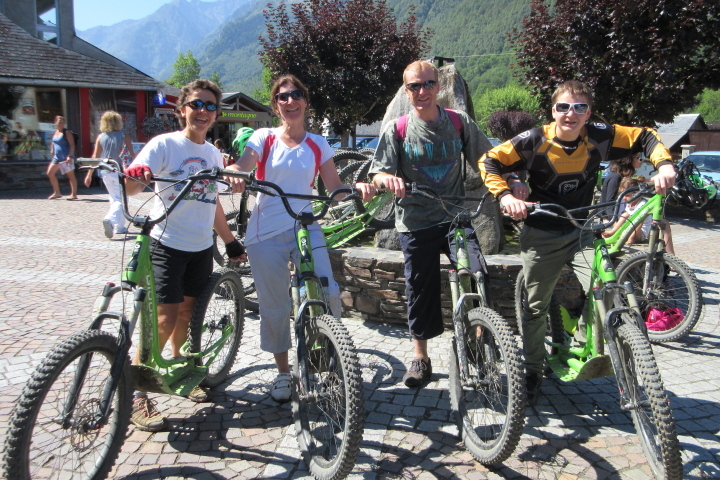 Really fun activities in an amazing mountain setting with a well organised itinerary. Enjoyed some warm sun and rain which actually didn’t make any difference to our activities and helped increase water levels. Great local markets and some nice simple French food. Excellent accommodation at Le Baluchon B & B in Cierp Gaud where Michel and Marie where lovely hosts. It is an old barn conversion but with very tasteful modern extensions and additions with views over the village and Pyrenean foothills. 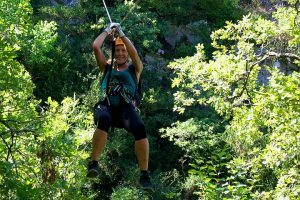 Fantastic week of activities in a stunningly beautiful area, Penny goes the extra mile to come up with an itinerary that in addition to the activities makes sure that get the most of each different area that you visit. Also excellent suggestions for start points for walks, felt like you were getting some local knowledge. Good private gite, interesting mix of new and old! Fantastic pool, covered terrace area and BBQ, great views from the terrace over the wooded foothills to the big mountains in the distance. Wide selection of games, good outdoor table tennis table, the only thing missing seemed to be a boule set for the boule area? High wires (Pyrenee Ho) and the kayaking trip (especially going over a small dam!) were the highlights for us. 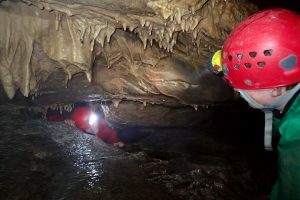 Discovered that as you get older you seem to feel less comfortable at activities that are at height (or underground) but both are no problem for an 8 year old! 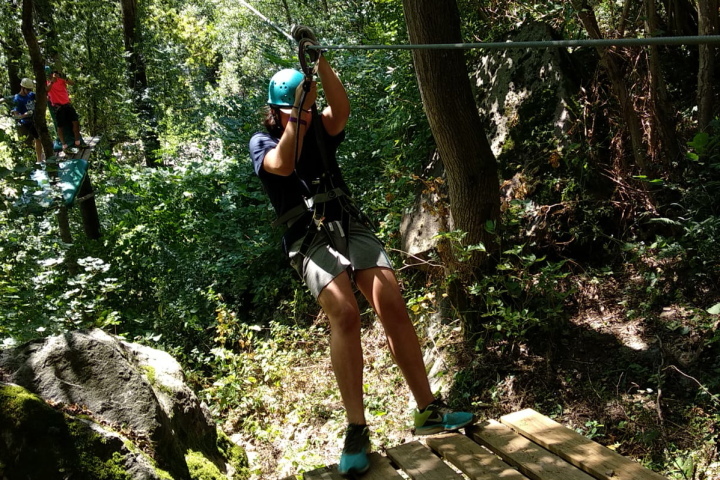 Penny organised an action-packed few days for our family including white water kayaking, downhill mountain biking, high wires, via ferrata and canyoning. The latter was a substitute for parapenting which was postponed due to low cloud, however it turned out to be the highlight of the week. Well recommended Penny! We stayed in a family suite (2 bedrooms and 2 bathrooms) at La Baluchon. Tucked on the hillside with amazing views our hosts Michel and Marie made us feel very at home. We enjoyed the shared breakfasts with other guests of all nationalities, which made for interesting conversation and exchange of ‘must see’ places to visit. A lovely B&B close to most of our activities, the spa town of Luchon and the beautiful Louron valley.